The Hometown Fire Company serves Rush Township. The fire company is dispatched by the state-of-the-art Schuylkill County Communications Center. The emergency number in Rush Township is 911. The fire company has their own equipment, committed volunteers, and trained fire police. Sworn fire police officers are: Capt. Merle Wertman, Lt. Arthur Bowman, Robert Wuttke Sr., James Greaser, Josh Grim, Heather Welker, Clarence Biehn, Bill Arner, Joseph Shamonsky Jr., Joe Storey, Clarlotte Fredericks, William Fredericks. To volunteer with the Hometown Fire Company, please call (570) 668-0274. Quakake Volunteer Fire Co. – Consolidated with Hometown Fire Company January 1, 2018. The Quakake Volunteer Fire Co. was organized and chartered in 1941. It was incorporated in the Court of Common Pleas of Schuylkill County on Nov. 24, 1941. On January 1, 2018 they merged with Hometown Fire Company. The fire station is a former three-room schoolhouse situated on two acres of ground in the village of Quakake. It was purchased from the former Rush Township Board of School Directors in the late 1960s before that group was merged with the Mahanoy Area Joint School District. The purchase price of $70 included the building, the land, and all contents. Dr. Fred Cox was president of the school directors at the time, and Carl Bachert was president of the fire company at that time. Dan Metzger was the recording secretary, and Irvin Leidinger was the building’s maintenance man (janitor). Current sworn fire police officers: Wesley M. Konsavage, Lorraine (Sissy) Brill, Georgeann Clemens, Tony Clouser, Art Frye, William Frye, Maryellen Koriesl, Matt Moyer, Nancy Neifert, Allen Witkowski, Matt Witkowski, Todd Witkowski. The Rush Township fire police started in 1971 with 3 members-Mickey Capos, Paul Miller, and Danny Tolan. Their only responsibility was to assist at fire scenes. The first Captain was Mickey Capos. Paul Miller was Lieutenant. 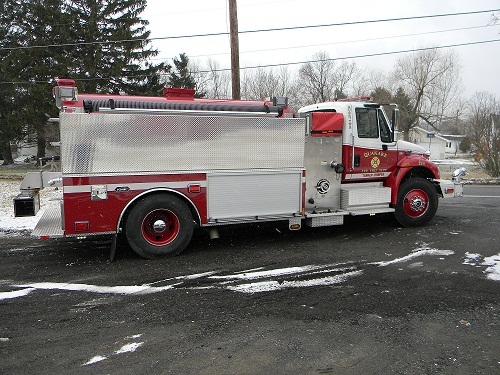 In 1984 they joined the Schuylkill County Fire Police, where they assisted at fire scenes and helped with traffic control throughout the county. In 1995 Paul Miller and Merle Wertman received additional schooling to enable them to better serve the community. At that time they answered 70 to 100 calls per year. Merle Wertman became lieutenant in 1995. In 2007 Paul Miller retired as Captain and Merle Wertman took over as Captain. At this time, 2010 our Fire Police cover 3 counties-Schuylkill, Carbon, and Luzerne. We have 12 Fire Police and 3 Secondary Fire Police. They respond to accidents, search and rescue, fires, crowd control, and other special assignments. They answer 150 to 190 calls per year. The are also a vital asset to our Police Department.